Melt your white candy melts. 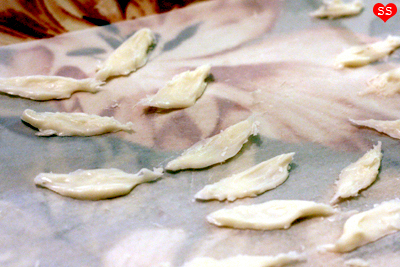 On a sheet of parchment or wax paper, trace out little pairs of wings with the white candy melts. This can be done by using a piping bag with a plain tip, or just done freehand with a spoon. Crumble the red velvet cake in a bowl and combine with the cream cheese frosting till no more streaks remain. Pinch off portions of the red velvet "dough" and roll them into ping pong ball sized balls. Place them in the freezer or refrigerator to firm up so they don't fall apart when dipped into the candy melts. By now, the white candy melt wings should be dry. Carefully peel them off the wax paper, keeping them paired up. Remove the red velvet cake balls from the fridge and stick a lollipop stick in each one. Melt the yellow candy melts. 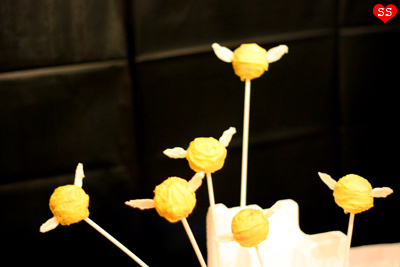 Dip a cake ball into the yellow coating and while it's still wet, stick a wing in the side of the ball and stick the matching wing into the opposite side. Repeat with the rest and enjoy when your pops are dry. That looks, DELICIOUS. Thanks for the instructions ;) I'll definitely be trying that out! Jess ♡: No problem! Red velvet cake is always good, hehe. How cute! That is such a good idea. 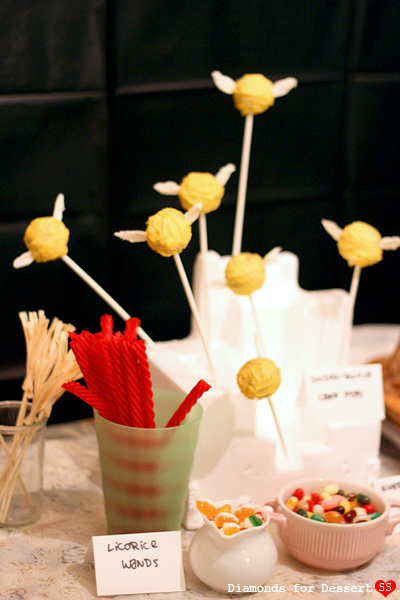 I just found your blog on tastespotting and I have to say I need to try this party idea! The cake pops are adorable and the sorting hat bread is awesome. Scrolling back a bit, the reindeer cookies are the cutest thing ever and I'm sad christmas is over. Mrs. Mordecai: Thank you :)! 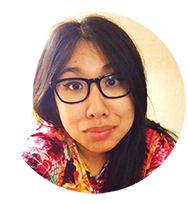 SimplePleasures: You're welcome! And thanks for the comment. Katie: I really hope you try it out! It was really fun. Thanks for the nice comments. I was searching for some HP cake ideas for my son's upcoming 9th birthday. I was planning only on a cake, but I just don't think I can resist also having butterbeer and Snitch pops! What a great idea! Quick question - with the Snitch pops, is there a specific reason to use the red velvet cake vs any other kind? Heather: Thanks! To answer your question, nope, any cake would be just as good. I just picked red velvet since I had leftover cream cheese from my "holiday light" red velvet cake pops (a few posts back) that I needed to use up. Hope your party goes well! This might be a stupid question, but I have to ask so I can make them...by "candy melts," do you mean colored white chocolate melts? I want to make sure so I can make these myself! Anonymous: Totally not a stupid question. Candy melts should be the same thing as colored white chocolate melts. The ones that I use look like this: http://www.wilton.com/store/images/site_images/1911-498_m1.jpg. As long as you can melt them and use them to coat your cake, it should be fine. Have fun making them :). Anonymous: Red velvet cake is a cake from the southern states of the US. It's a slightly chocolaty cake, usually paired with a cream cheese frosting. Red velvet is identified most readily by its distinct red color, due to the red food coloring in the recipe, but also in part due to the acidic ingredients enhancing "redness" in the cocoa powder. A party's worth of 8-ish-year-olds thank you for this. My sister-in-law found this idea and made it for my twins' birthday over the weekend, and they were a hit. Laura: Haha, thanks for sharing. Sounds wonderful. Anonymous: Ooh, broken link! Just fixed it. It's the same recipe I used for the holiday light cake pops (same link as the cream cheese icing). But thanks for catching that!